US Federal Reserve chair Janet Yellen said the Fed should "proceed cautiously" before raising interest rates. She said global risks were not expected to have a deep impact on the US, but caution was still appropriate. Global developments and risks had led policymakers to project a slower path of rate rises than initially expected in December, Ms Yellen said. 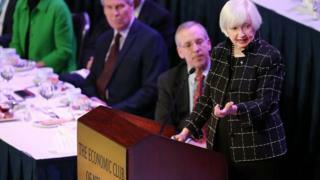 US markets rose during her speech at the Economic Club of New York. Her tone was similar to the Fed's statement in mid-March, when the central bank made no change to rates and guided expectations towards a slower pace of increases after December's increase. Ms Yellen repeated her message from earlier public speeches that volatile oil prices and China's slowing growth, along with how soon inflation would reach the Fed's 2% goal, were key factors guiding the Fed towards taking a gradual approach on raising rates. Omer Esiner, chief market analyst at Commonwealth Foreign Exchange, said her caution was not surprising, but stood in contrast to support for rate rises from other Fed speakers in recent days. He added: "On balance, [Yellen's] comments do not sound consistent with a looming rate hike in April and leave considerable doubt about whether rates will rise in June. Earlier on Tuesday the head of the San Francisco Federal Reserve, John Williams, said the US economy was doing "quite well". As she has done in past speeches, Ms Yellen said the market should be open to the possibility of news that boosts confidence. "We should not ignore the welcome possibility that economic conditions could turn out to be more favourable than we now expect," she said. The audience in New York laughed when Ms Yellen was asked how long the Fed expected to take to reach "normal" interest rates and whether she felt the market had failed to understand the bank's plan. The Fed chief has been trying to reassure markets of its "gradual" plan since taking action in December. Following Ms Yellen's speech, Wall Street climbed sharply . The S&P 500 rose 0.8% and the Nasdaq index jumped 1.5%, although the Dow Jones Industrial Average added just 0.1%. Although the focus of her speech was on interest rates, Ms Yellen did address the other tools the Fed has at its disposal if the US economy was to suffer a downturn. These unconventional tools - including asset purchases, forward guidance and negative interest rates, which have been used in Europe - have been criticised for helping banks and not stimulating economies. Ms Yellen defended the use of these tools, saying they helped prevent the recession from becoming worse. "They have been effective policy, they have made a difference and inflation may have been lower and unemployment higher - by noticeable amounts - had we not employed those policies," she said.